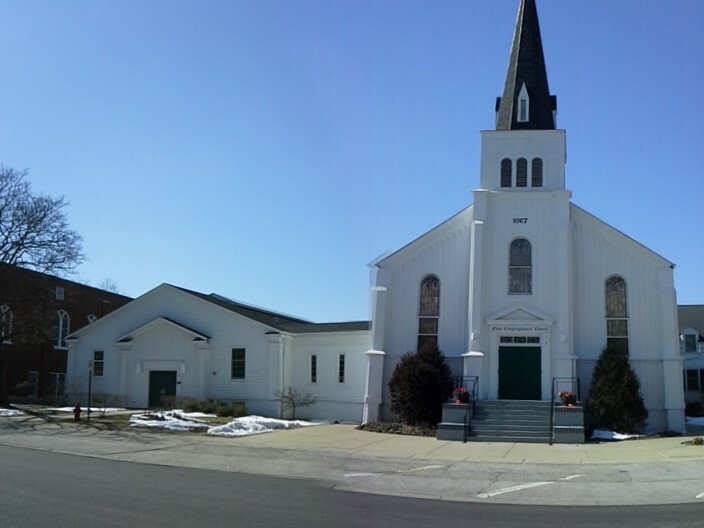 The First Congregational Church (FCC) was organized on January 10, 1842, which was just six years after our community’s first settlers, Beman and Polly Crandall arrived and settled in Crystal Lake. At the first meeting, nine people met for the purpose of organizing a Christian church. The charter members were: George & Elizabeth Dike, Mr. & Mrs. Reuben Jenny, Mr. & Mrs. Allen Baldwin, John & Eliza Salisbury, and James T. Pierson. Two months later, Rev. E.H. Howe was hired to preach every fourth Sunday. His salary was $37.50 per year. Early church services were held in members’ homes. Services were also held in the one-room, 20’ x 20’ log cabin schoolhouse located at the northwest corner of Virginia Street and McHenry Avenue (current site of Goodyear Autotech). By 1845, a decision was made to erect a church building. A building committee was formed, plans were made, and funds were raised. 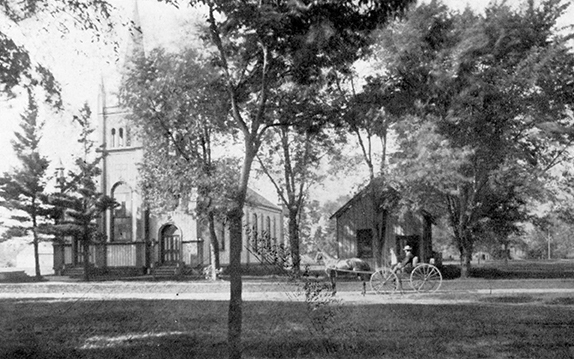 The first church building was dedicated in 1849. This building was later sold to the Methodists, moved to Nunda, and eventually became part of the old Pingry Hotel. As early as 1850, church records indicate the congregation took a very definite stand against slavery, as it existed in the southern states. Early records also indicate a stance against “the use of alcoholic spirits, except for necessary medicinal or chemical purposes,” and forbade members from “associating with parties convened for ungodly and worldly amusements, including dancing, card parties, the theatre, the circus and horse racing”. Somewhere along the line, most of these rules lightened up, except for the stance against slavery. During the Civil War, the Soldiers Aid Society was organized by leaders of the congregation. Its purpose was to assemble relief packages and ship supplies to our men fighting in the Union Army. By 1863, the members of FCC recognized a need for a larger church. After considering several locations and prices, the building committee decided to buy four lots on Park Street (now Pierson Street) from Simon S. Gates at $100 per lot. Mr. Gates, a deacon of the church, donated one of the four lots, making the cash price $300 for all. The current church building was erected in 1867 at a cost of $7,000. The bell which tolls each Sunday was placed in the tower July, 1875 as a gift from C. Franklin Dike. It is 48 inches in diameter, weighs nearly 1,600 pounds and cost over $600. At its first ringing it was said it could be heard as far away as Barrington! Early photos of FCC shows two entrances to the church. In 1914, these were closed and replaced with the centered main doorway known today. Other changes that occurred in 1914, include the raising of the church by two feet and the excavation of a basement under the main sanctuary. The basement was finished and provided space for a furnace room, kitchen, washrooms, and Fellowship Hall. Perhaps one of the most wonderful changes that occurred with the 1914 remodel was the addition of fourteen large stained glass windows in the sanctuary and narthex, each bearing the name of a family or deceased member. The names on the these stained glass windows were Ford, Pomeroy, Rollins, Gates, Dike, Henry E. Gibbs, Burton, Deacon Reed, Julia Robinson, Foster-Teckler, Crow, Crosby, Alfred Walkup and Dwight. Due to numerous remodelings, renovations, and additions over the past 100+ years, only seven of those windows with names still grace the walls of the sanctuary. 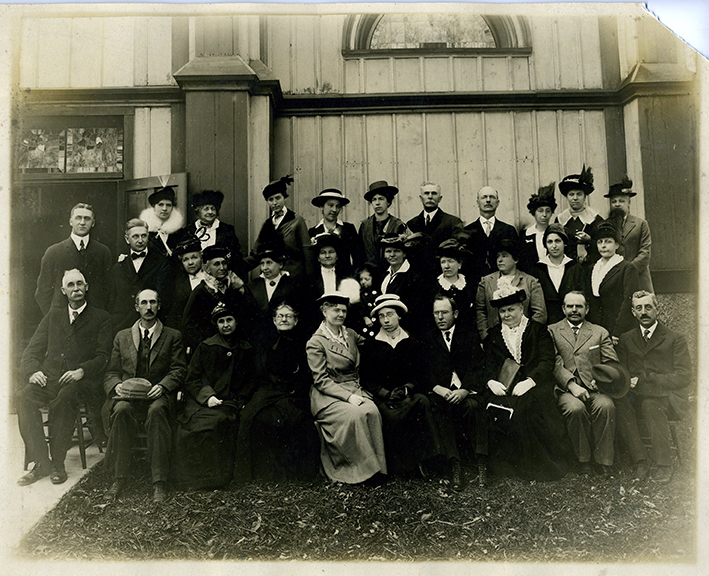 At the completion of the 1914 remodeling project, church members took time to pose for a congregational photo. Since 1842, nearly 50 ministers have served as senior pastor of FCC. None have passed the tenure of Rev. M.J.A. Dalrymple, who was hired in 1935, and served the congregation for over 30 years. Rev. Dalrymple was well-known in our community, as was his next door neighbor, Fr. E.A. McCormick of St. Thomas Catholic Church. In 2017, the First Congregational Church celebrated two important milestones: 1) the congregation has continuously worshipped in Crystal lake for 175 years (1842-2017); and 2) the church building, erected in 1867, has housed the congregation for 150 years. Congratulations FCC!